MAM's new oral care products with Brushy the bear have been developed with pediatric dentists to ensure babies develop effective and lasting oral hygiene habits from the beginning. The MAM Learn to Brush Set includes one Training Brush, one Baby's Brush, and one safety shield. The Training Brush includes a longer handle to allow for baby and parent to brush together to ensure proper technique. The Baby's Brush has a short compact handle, perfectly sized for baby's hands for independent brushing. Both brushes have soft, round bristles that easily clean plaque and bacteria and a toothpaste indicator that shows the recommended amount of toothpaste. MAM's new oral care products with Brushy the bear have been developed with pediatric dentists to ensure babies develop effective and lasting oral hygiene habits from the beginning. Each brush comes with a safety shield which helps keep the brush at a safe distance from the back of the baby’s mouth. 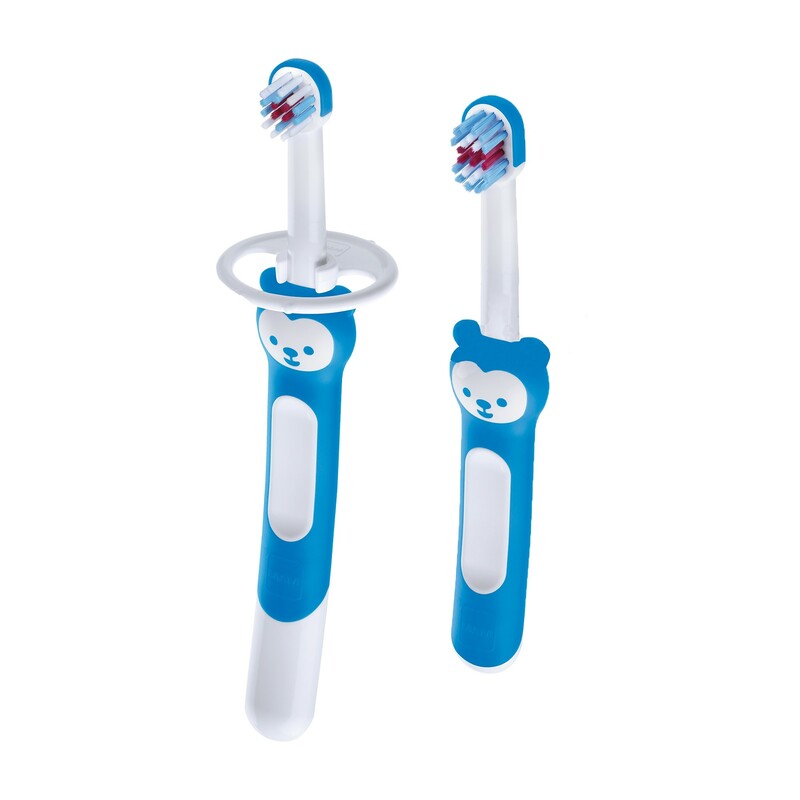 Brushy the bear loves brushing his teeth and with Brushy's story on mambaby.com and the free Brushy app, your child will too! The MAM Learn to Brush Set includes 1 Training Brush, 1 Baby's Brush, and 1 Safety Shield. The Training Brush includes a longer handle to allow for baby and parent to brush together to ensure proper technique. The Baby's Brush has a short compact handle, perfectly sized for baby's hands for independent brushing. Both brushes have soft, round bristles that easily clean plaque and bacteria and a toothpaste indicator that shows the recommended amount of toothpaste. 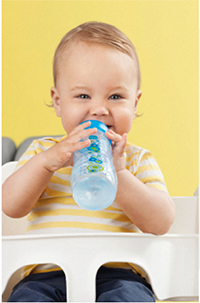 The Safety shield keeps brushes at a safe distance from the back of baby's mouth. Soft, rounded bristles easily remove plaque and bacteria. The red bristles indicate the recommended amount of toothpaste.